When working with VMWare it is crucial to monitor the performance of your HA clusters and VMs. It is important to be able to get performance data so you can make sure your VMs have the resources they need and to know if they are sized correctly. To determine this I often use the CPU usage and CPU ready performance counters. – What are the cpu usage/ready perf. counters and what do they show us? The CPU usage value is sort of like the value you see in the task manager in windows, the main difference being that this value is not measured by the VM’s OS but by the ESXi host it is running on. As in the task manager this value indicates how much CPU is being used by your VM. – Why should I use the script found in this blog post? 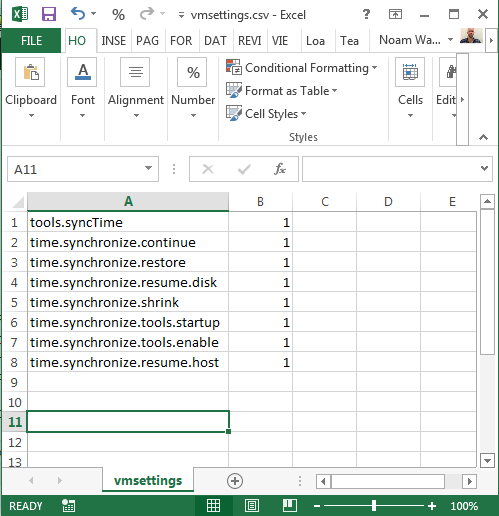 Gathering data like the performance counters described above can be done with Vcenter Operations Manager or with Veeam if you have this. However these applications are complicated to use and configure (and cost a lot of money). The script I have written below will give you a simple list/csv of the VMs in a given cluster with their CPU usage and CPU ready values in percent. You can then review your VMs and see check for any high/problematic values you find and improve the efficiency of your infrastructure. Any VMs with an average cpu usage over 70 % should probably be assigned more resources. If there are any VMs with ready times of 10% or more it probably means that your cluster/host is overcommitted or that the VM is oversized. To simplify the structure of the script I have divided it into three sections variables, functions and script main. $ClusterName = "Some_cluster" #CPU usage and CPU ready values will be collected for all VMs in this cluster. $DaysBack = 14 #Number of days back to collect performance counters. $rdy_interval = 7200 #interval of rdy time values aggregation/averaging in seconds. This value should be changed according to your vcenter statistics settings. Before running the script you will need to change the values in the #parameters section according to your needs/environment. $vcenter should be the name of your vcenter server and $ClusterName the name of the cluster you wish to collect VM performance data from. $DaysBack is the amount of time you wish to collect performance from. E.g if it is set to 14 days you will collect performance data going back 14 days to the time you are running the script. Make sure you set this value to a valid number of days (your vcenter DB must retain the info for the amount of time specified). I have found that performance data is more useful when it is gathered in business hours so the results show values reflecting a busy system. To gather performance counters from the relevant times of day you must change the values for $peakTimeStart and $peakTimeEnd to suit your needs. Connect-Vcenter is a small function that simply adds the snap-in for VMware cmdlets and connects to a vcenter server making the powershell instance ready to fire commands. This function uses the vmware cmdlet Get-Stat to collect the performance counter cpu.usage.average in the specified timeframe. The average value of all the collected data points are then returned. Get-VMCpuRDY collects the average values of the performance counter Cpu.Ready.Summation in the specified timeframe. As explained earlier in the post this counter returns a summation of the milliseconds in which the CPU was waiting for resources. In order to convert this into a percentage value I first divide the amount of milliseconds by 1000 to convert to seconds. I divide this amount of seconds by the $rdy_interval, which is the amount of seconds between each data point, and then multiply by 100. I then use [Math]::Round to round off the value to one decimal which is the number returned by the function. $AvgCPUValue = "" | Select "VM","CpuAvg","CpuRdy" #create a custom object with these properties. In the script main I first connect to the vcenter server using my function Connect-Vcenter. I then create an array $AvgCPUValues. The next step is to loop through all the VMs in the cluster using Get-Cluster $ClusterName | Get-VM. In the loop I create a custom object for each VM with the properties VM, CPUAvg and CPURdy. I use the functions Get-VMCPUAverage and Get-VMCpuRDY to get cpu usage and cpu ready values and then assign these to the corresponding properties on the custom object. The custom object is then added to the array $AvgCPUValues which I created in the beginning of the script main. When the loop has completed I then export this array to CSV in the directory the script was run. – That’s it! You’re ready to go! I really hope you find this script useful. Remember to fill out the #parameters section before you run the script. I have copied in the full script below. #+					to a CSV file in the script directory.